With blueberries in full abundance for only a short time, we gather and preserve blueberries in as many ways as possible. The question is how to make blueberries last longer? We use blueberries in smoothies, oatmeal, granola, in pies, or on top of ice cream as well as flavoring kefir and kombucha all winter long. If you are what you eat, then we have 5 blueberries in this family. However, freezer space is very limited as we lost a large deep freezer and haven’t had the money to replace it. For delicious fresh blueberry muffin recipes, read here. I have 50lbs. of blueberries that I needed to store and thought to look for other ways to preserve blueberries. Some options that I usually turn to are freezing, canning, and dehydrating. They can store for up to a year without losing taste and quality, and I don’t have to worry about a power outage and losing them. 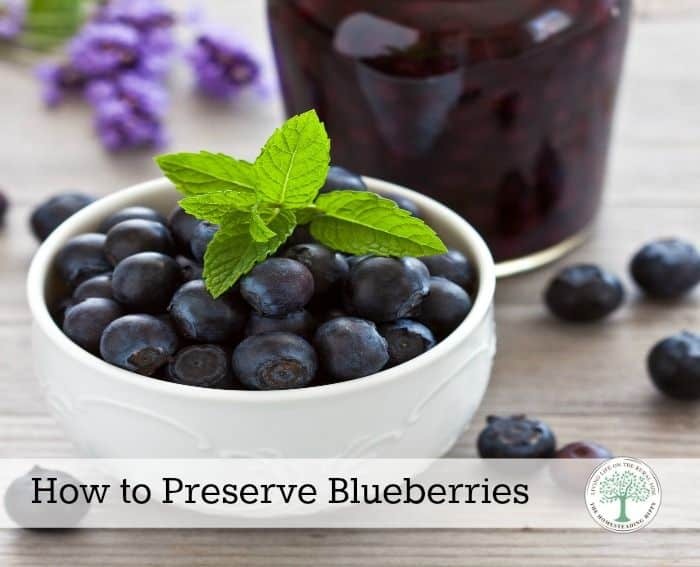 Here are 3 of the best ways to preserve blueberries. Get the recipe for raw blueberry jam here. 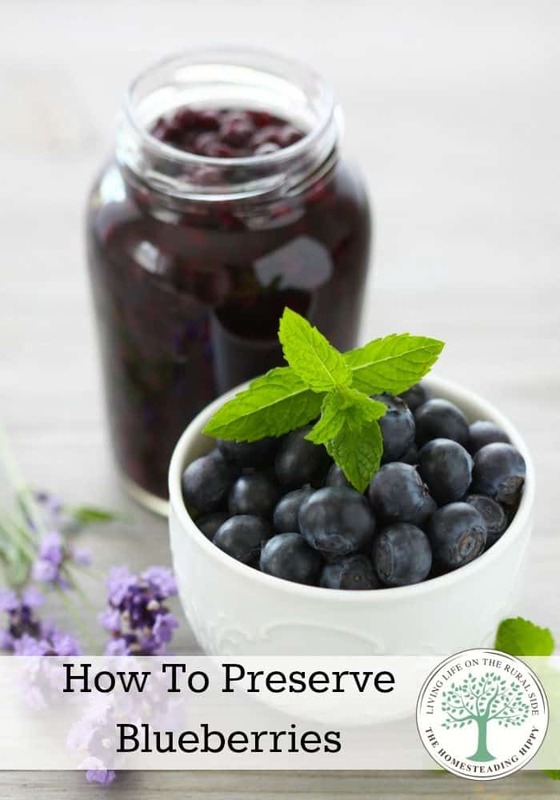 Here’s how to preserve blueberries by canning. First, get some blueberries. Easy enough, right? I got these at our local produce auction. Layer 4 cups of blueberries and cover with 1 cup of sugar in a large pot. Continue with those layers until the pot is about 2/3 full. You don’t want to overcrowd the berries at all. Let sit for about an hour or so, until the berries begin to glisten. They get so pretty! Turn the pot on medium-high heat until the blueberries and juice begin to boil gently for 5 minutes. Ladle into hot quart jars and water bath for 20 minutes. Remove from boiling water, let cool and test the seals. Any that didn’t seal should be refrigerated and eaten within a week or so. Wipe down the rest of the jars and store in a cool, dry place for up to a year. 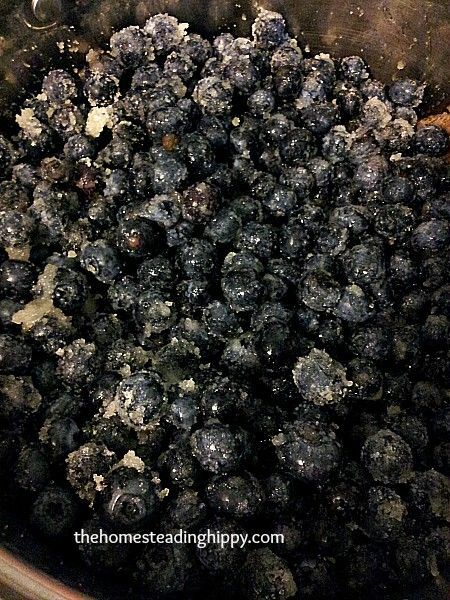 For pressure canning blueberries, process for 5 minutes on 5 pounds pressure. Allow canner to cool, then remove and cool jars. Lay blueberries on a baking sheet in a single layer. This way, you can put them in freezer bags and they are frozen in a “free flowing” form and are easier to use in recipes later on. If I have a lot to do, I will put freezer paper on top, and add another layer of blueberries. I can usually get 3 layers per baking sheet this way. Lay flat in the freezer for 24 hours, then remove to airtight freezer bags. To use, simply take out the bag, and remove the blueberries you need for your recipe. Get more canned blueberries recipes PLUS frozen blueberry recipes here! Poke a pin-prick size hole in each berry to allow for proper drying. Place the prepared berries on a dehydrator sheet (here’s the one I use) in a single layer. Dehydrate on medium or 145 degrees for 6-8 hours. Once dry, place the berries in an airtight container. These dried berries are great for granola, trail mixes, and just plain snacking. If you want, you can also rehydrate them for other recipes by placing one cup of dehydrated berries in one cup of hot water for 10 minutes. You want the lids to be hot, but you want to use NEW lids each time you can. You don’t want to reuse the same regular canning lids, as this could lead to a seal failure. Coming from Green Mom’s Network FB support thread! I love blueberries. Have been wanting to can some jams/jellies. Just finished canning apple butter. Cool! I never thought of canning blueberries. We always froze them growing up! It is my mission that next year I begin canning, this post makes it seem fairly easy. Yum!!! I am going to have to go get some more blueberries so I can make some for the winter!! !